Acceptance of terms and conditions of AIRPORTELs Co., Ltd.
Our services are only available for users who have been the age 18 or older and become legally adult under Thai laws. By using and accessing our website, application, services, you warrant that you are in the age 18 or older; agree and respect our terms and policy; and be able to form a contract with AIRPORTELs Co., Ltd autonomously. AIRPORTELs Co., Ltd. is an organization registered in the Kingdom of Thailand under number 0125558026773 and with our registered office at Pruksa Ville 64 Saimai 29/217 Saimai Bangkok 10220 (บริษัท แอร์พอเทลล์ จำกัด เลขประจำตัวผู้เสียภาษี 0125558026773 หมู่บ้าน พฤกษาวิลล์ 64 สายไหม 29/217 แขวงสายไหม เขตสายไหม กรุงเทพมหานคร 10220). All the information, contents, features, and functionalities (including but limited to website, application, software, audio and video, animation, logo, text, display, image, design, and logo) revealed on the channels (including but not limited to website, application, brochure, signage, and flyer) of us are owned by AIRPORTELs Co., Ltd.
Users and participants are defined as you, the reader of this article, or any third party who utilized, partnered, allied, cooperated, or any other kind of collaboration who participate and is involved in our services. By registering in our services, you will be given an account and a coordinated password. You must treat the information confidentially and not disclose it to any person or entity. You acknowledge that you will notify us immediately when your account has unauthorized access or any other kind of security breach. We will have the right to disable any kind of violated, improper, or illegal activity on any property of us and terminate the right of services and account usage when you breach any of the terms. Booking or reservation made by yourself or the other authorized third party is under the identification of the user. All the information should be accurate and acknowledged by the owner of the information. The information of status and circumstance of the services will be updated and notified ONLY via email and/or on https://www.airportels.asia/. Please be notified that the name of booking or reservation should be aligned with the document of identification (passport or ID certification) that will be provided. We ONLY accept PASSPORT, DRIVER LICENSE of Kingdom of Thailand, or ID CARD of THAI CITIZEN for identification. You should always receive accurate and updated e-mails sending ONLY from [email protected] and [email protected] after request or confirmation. All booking information and requests are ONLY referring to e-mail sending from [email protected] and/or printed receipt(s) and slip(s) from AIRPORTELs. All pricing, transaction, or any other act related to money will be done ONLY via website and/or e-mail or at our counter (reception desk) in the following list Please be aware that any request for money, benefit, or any other kind of transaction which is not happened at our appointed place or channel IS NOT authorized by us. The price of the services is revealed on the list via our channels. We may change the price, but the price will be SET once a booking or reservation has been confirmed, and all the price revealed is VAT INCLUDED. Any additional request which is not included in the same booking or transaction will be seen as a new order, and the price MAY be different. All transaction can be paid by credit card, debit card, and cash and is in THB, THAI BAHT(฿). Accepted payment methods are in the following list. All process of the service, from booking to billing, should be done under the same name and the same person. Real, physical passport or the other accepted certificates of identification WILL BE asked when doing the transaction. The scale which is used for weighing and formulating the bill is maintained and follow the standard of ISO 9001. As you agree to use the service, you also agree with the results provided by our scale. We will then provide you the accurate invoice with price based on the weight we measured. You SHALL always receive payment receipt in hard or soft copy after the transaction is done. All detail and information of price of service will be revealed in the invoice once billing is confirmed, and NO hidden charge will be included. You have the right to ask for interpretation if any statement from our services is obscure. The entity who uses the service should be the same as the entity who receive the luggage or bag. The price on an invoice (if provided) and aligned receipt should be exactly the same. Receipt(s) will be given ONLY when a transaction is done and acceptance of this terms and conditions provided by you. By receiving a receipt or receipts, you agree that the service is closed. We deliver and provide our services exactly the same as the statement we published via our website, application, and documents at our counter. Subjected to section 13, if we fail to deliver an in-bound delivery on our scheduled delivery time, we will give 100% refund to you. Subjected to section 13, if we fail to deliver an out-bound delivery on our scheduled delivery time, we will be responsible for the necessary payment to send your luggage to the ultimate destination appointed by you. We will notify you any change of circumstance and/or content that will affect the behalf of you via the contact(s) you provide. You warrant that you DO NOT pack any prohibited item(s), listed in section 15, in your luggage that will be delivered or stored, and the services are used properly. You are responsible for any loss or damage caused by any misuse or breaching of our terms and conditions. The slip of certification and receipt should be taken and preserved by yourself and ready to be checked when you do billing or check out at our counter. You agree that your information provided to us is accurate and acknowledged by yourself either it is given by yourself or an authorized entity. Proof or certification (credit/debit card or passport) of your signature or identification MAY be asked by our associates to ensure your identification. All of our services should be used with a lawful purpose. By using our delivery service, you agree to our terms and respect laws of the Kingdom of Thailand. We WILL NOT break your luggage by any illegal purpose, but in certain circumstances, we will collaborate with official or governmental authority of the Kingdom of Thailand for investigation and illegal acts prevention, if any suspicious, illegal, risky, or dangerous items appears when we are notified by Thai official authority or items been found by X-ray scanner or the other non-wrecking investigations. You MAY be asked to let your luggage be checked or investigated by our staff. If you reject to do so, we may refuse to provide you services for security reasons. We have the right to reject and cancel your request, booking, reservation, or any other service if you violate the terms and/or are suspected for any illegal, risky, or dangerous act(s) WITHOUT refund. For security purpose, we MAY collaborate with authorized authorities to investigate any suspicious parcel, bags, or containers in any kind of form we delivered or stored. You may request luggage seal, a yellow tie with AIRPORTELs logo AND serial number, for each piece of luggage. After sealing, we DO NOT allow to open the seal until the service ends under any circumstance, expect under suspicious event or request for investigation from official or governmental authorities. For additional piece of sealing tie, the fee is 20 THB/piece. A piece of regular luggage is defined as that each edge (Width, Length, and Height) or diameter of the luggage needed to be delivered SHALL NOT exceed 1 METER (approx. 3’3”) and the weight of each piece of luggage should not exceed 25KG. Failure to meet aviation security requirements. Failure to make your luggage to be able to be delivered on time at the airport. Failure to make your luggage to be able to be delivered on time at the hotel. Failure to book, reserve, or cancel our services on time. Action(s) of official or governmental entity(s) and authority(s) (E.g. Police force, Customs, Airport operator, and Authority of aviation). Disruption of regional or national ground and air transportation. Natural disaster(s) (E.g. Flood, Earthquake, Tsunami, or Typhoon). Uncontrollable circumstances caused by any third party (E.g. Riot, Strike, Fire Disaster, Investigation by official or authorized entity(s)). Breakage or loss of your luggage or property by the action(s) of a third party which is out of our control. Living or deceased plants or animals. Money (Banknote, coin, credit/debit card, and travelers cheque). Fine art, antique, jewelry, documents, software, or any other invaluable item. Materials that could be defined as pornographic or indecent. Precious metal (Such as gold or silver in any kind of form) and precious stones. Explosives, fuel, hazardous, or flammable materials. Radioactive materials, items which emit fumes or other strong odors. Firearms, ammunition, illegal drugs, or other controlled substances by local law. Any risky, dangerous, or harmful item which is prohibited by civil aviation authority. Stolen goods or other contraband. Perishable or spoiled food which emits fumes or other strong odors or generates liquid. Batteries and electronic devices (Including but not limited to watch, clock, phone, laptop, or tablet which includes battery). For labeled luggage and confirmed order, we will ensure the delivery or services to be delivered or provided on time and to the accurate destination and consignee. If we fail to provide our promise, the compensation SHOULD NOT exceed the price or in any value of 100,000 Thai Baht for one order. We SHALL NOT be liable for any FRAGILE or PERISHABLE item(s) or contents of your luggage delivered by us. We SHALL NOT be liable for any PROHIBITED item(s) or contents of your luggage delivered by us. We SHALL NOT be liable for any circumstance when you breach or violate our terms or Thai law(s). We SHALL NOT be liable for any excluded, dangerous, or prohibited item(s) or contents of your luggage delivered by us. We SHALL NOT be liable for any of your property or belongings before your luggage or gear is given to us in any circumstance. We SHALL NOT be liable for any of your property or belongings after the transaction is closed and luggage is retrieved by the customer. We SHALL NOT be liable for any of your property or belongings if any entity, including you, shows valid references to retrieve your belongings. We SHALL NOT be liable for any of your property or belongings if any entity, including you, retrieves your belongings out of our counter at the destination. The sentimental value of items SHALL NOT be relevant to their valuation. Any attachment on the luggage such as name tag, accessory doll, pillow, or small bag, IS NOT guaranteed on its conditions or loss. 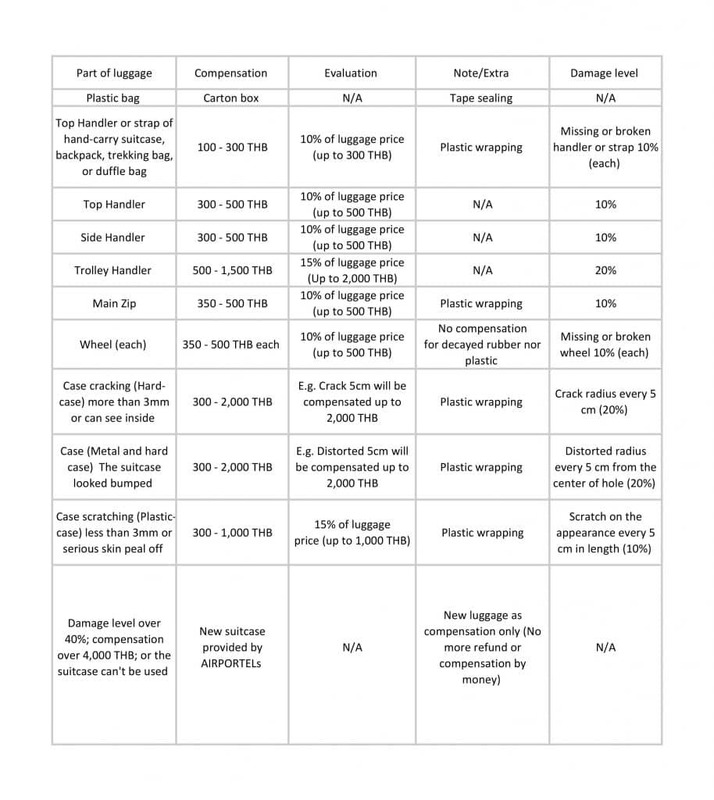 In an unfortunate event that your luggage or bag is broken and is confirmed that the loss and damage was caused during TRANSPORTATION via VEHICLE by AIRPORTELs, the compensation will be referred to the following table. You have the right to change or cancel booking or reservation at any time before our assigned due time without any additional fee. “Luggage”, “luggage”, “Baggage”, “baggage”, “Gear”, and “gear” are any item or entity that is asked by our clients/customers to be delivered to an appointed destination and is shorter than 1 meter on each dimension AND lighter than 25KG. “We”, “we”, “Us”, “us”, “Our”, and “our” stand for AIRPORTELs Co., Ltd.
“You” and “you” means any participant who accesses, utilizes, and involves Website and Services of AIRPORTELs Co., Ltd.
“Consignee” and “consignee” means the entity who provides valid references provided by AIRPORTELs and valid passport or Thai ID to retrieve luggage from AIRPORTELs Co., Ltd.
“Participant(s)” and “participant(s)” are any individual(s), group(s), organization(s), company(s), institute(s), or entity(s) who is on behalf of the activity(s) (including but not limited to transaction(s), information sharing, and business(s)) with AIRPORTELs Co., Ltd.
“Services”, “services”, “Service”, and “service” are any activity and support provided by AIRPORTELs Co., Ltd., including but not limited to website, application, and delivery service. “Prohibited item(s)” and “prohibited item(s)” include but not limited to any item or entity that is risky, dangerous, perishable, potential to be harmful, and/or not allowed to be transported under the regulation of air and ground transportation set by any regulatory or governmental body including but not limited to Civil Aviation Authority and government of the Kingdom of Thailand. “Passport” and “passport” are the official and legal certification of status issued by governmental institute or regulator of the state of the nationality of an entity. “Dangerous act(s)” is any action, activity, or movement that will cause harm, loss, or breach the law(s) or any legislation(s) of the Kingdom of Thailand. “Risky act(s)” is potential and/or intended to cause harm, loss, or breach the law(s) or any legislation of the Kingdom of Thailand. “In-bound delivery” means the luggage delivery from an appointed airport to an appointed hotel. “Out-bound delivery” means the luggage delivery from an appointed hotel to an appointed airport. “Appointed” and “appointed” are adjectives to describe any entity that is aligned with AIRPORTELs in any type of collaboration. “Associate(s)” and “associate(s)” are any staff, employee, or worker who is legally contracted with or employed by AIRPORTELs Co., Ltd. and always in the uniform of AIRPORTELs Co., Ltd. and his/her name tag during the work. “Scheduled delivery time” and “scheduled delivery time” are the appointed and/or arranged time point revealed in the published statement of AIRPORTELs Co., Ltd.
“Non-wrecking” and “non-wrecking” are adjectives to describe any process, approach, or method that will not physically disable, harm, or break the function or appearance of any physical item. All the time, day, and date conditions revealed in this document, customer booking, orders, or any other documents provided by AIRPORTELs are in Thailand local time, ICT, UTC/GMT +7 hours. For any service information or controversy, AIRPORTELs ONLY refers to e-mail sent from [email protected], printed retrieval slip, AIRPORTELs website, AIRPORTELs management system, or any physical documents provided by AIRPORTELs authorized associates. A piece of REGULAR LUGGAGE is defined under the regulation of airlines and can be checked or carried with the flight which the customer will take. Any sport equipment (including but not limited to surf/snowboard, golf bag, and bicycles), instrument (including but not limited to cello, guitar, piano, and drum), and baby carriage/stroller is NOT regular luggage. Any luggage should be in its pristine condition and can be closed, sealed or zipped accordingly. All luggage should be separated rather than being bundled or attached with any other item, including but not limited to plastic bag, traveling pillow, and small traveling bag(s). Subjected to section 15 in “Standard terms and conditions “, the luggage SHALL NOT contain any illegal, dangerous, prohibited, risky, or suspicious item, and AIRPORTELs reserve the right to deny any luggage or belonging(s) is out of service conditions. Any attachment such as name tag, accessory doll, pillow, or small bag, which is not counted as a single piece of luggage, IS NOT guaranteed on its conditions or loss. Order(s) should be placed at least 2 hours before using service and be confirmed by AIRPORTELs. AIRPORTELs reserve the right to reject or subsequently cancel Bookings where we believe there to be mis-use of our Services by you or a third party for commercial gain. The customer should ensure all the information and contacts are valid and reachable. After booking, the latest order information and status can be checked at https://app.airportels.asia/tracking by inserting order ID. Booking is confirmed ONLY after the payment is completed, and the customer has received confirmation e-mail sending from [email protected] or [email protected]. To change the booking, the request should be placed via e-mail ONE DAY BEFORE MIDNIGHT, 24:00, before using the service. After confirmation of amendment, the customer SHALL receive an update e-mail from AIRPORTELs. After the amendment, the latest order information can be checked at https://app.airportels.asia/tracking by inserting order ID. To cancel the order with full refund, the request should be placed via e-mail one day before midnight, 24:00. Booking or order that is cancelled after midnight, 24:00, on the service using date WILL NOT be refunded. Refund will be implemented within 5 working days. Refund will ONLY be proceeded through our accepted wireless transfer channel. The booking/order will be considered as “NO SHOW” since the appointed service starting time. After service amendment/change, you shall receive keep the confirmation e-mail as reference. After service cancellation, you shall receive keep the confirmation e-mail as reference. Subjected to section 4 in standard terms and conditions, AIRPORTELs WILL change terms and conditions accordingly or periodically. Order(s) and customer booking(s) are always confirmed ONLY AFTER the payment is cleared by the customer. For scheduled delivery, AIRPORTELs staff will contact and confirm with the front-desk of the property, or any entity who will keep the customer belongings until AIRPORTELs collect. AIRPORTELs courier, driver, or staff will collect luggage from the property in 3 hours AFTER the appointed drop-off time. 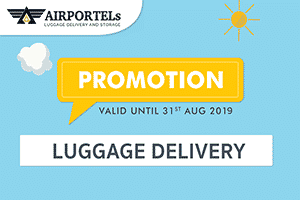 For on-demand delivery service, AIRPORTELs courier, driver, or staff will collect luggage from the place 30 minutes BEFORE or AFTER the appointed drop-off time at the gate or lobby of the property for out-bound delivery service. If the customer put luggage at the place of delivery late, including but not limited to airports, hotels, shopping malls, or homes, AIRPORTELs will ONLY wait up to 30 minutes. 30 minutes after the appointed time or in the condition that AIRPORTELs can’t contact the customer, the order will become “No Show” and be cancelled WITHOUT refund. If AIRPORTELs courier, driver or staff can’t find the luggage from the booking at the appointed location, AIRPORTELs will use ONLY phone or e-mail to contact the customer. AIRPORTELs SHALL NOT be liable for any FRAGILE or PERISHABLE item(s) or contents of your luggage delivered by us. For further details of prohibited items, please refer to section 13 and 15 in standard terms and conditions. The service is only available for luggage under size 80*80*80 (cm) and up to 25KG. 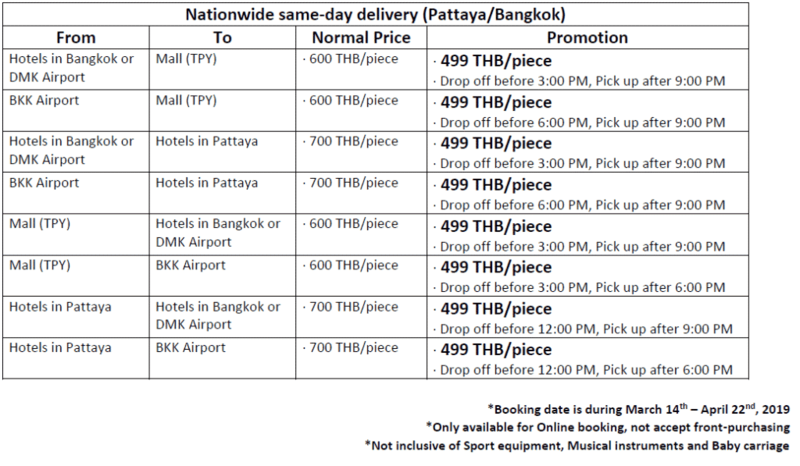 For luggage over 25KG, additional 50 THB/KG will be applied. If additional weight is less than 1KG, the charge WILL BE counted as 1KG. Oversize luggage, such as sport equipment that one of the edge is more than 80 cm, IS NOT available for the service. If the drop-off location, origin of delivery, is not at any of AIRPORTELs branch, additional charge 100 THB/Bag will be applied. For next day delivery, the luggage SHALL BE dropped at AIRPORTELs before noon, 12PM, on the delivery day. For destination in service area in Thailand, the fastest time of delivery can be in the evening on the next day after drop-off. For destination out of service area in Thailand, the fastest time of delivery can be in the evening on the 2nd next day after drop-off. The fastest time of delivery ONLY can be referred on business days, Monday to Friday. For nationwide delivery service in Thailand, AIRPORTELs DO NOT guarantee for on-time delivery at certain appointed date and time. AIRPORTELs reserve the right to deny any luggage or belonging(s) is out of service conditions. For same-day delivery, the luggage SHALL BE dropped at AIRPORTELs before noon, 12PM, on the delivery day. If there is any prohibited item in the luggage, customer SHALL agree AIRPORTELs to open and take prohibited item to be reserved AND pay for extra service fee aligned to AIRPORTELs service charge. Subjected to section 1, the service is ONLY available for delivering regular traveling belongings. AIRPORTELs SHALL reserve the right to refuse delivering if any of the luggage or belonging(s) is out of conditions. All items subjected to section 15 in “Standard terms and conditions”. Batteries, including but not limited to Power-bank, mercury battery, and lithium battery. Flammable items, including but not limited to Curling irons, spray and lighters. Dry Ice, Brine or Gel / Ice Packs. Liquids and Gels (including but not limited to aerosols, toiletries, and alcoholic beverages). Powder (including but not limited to baby powder, dry shampoo, and powder detergent). Valuable items, including but not limited to cash, banknotes, cheque, precious stone/metal, antique, documents, and fine arts. For orders reserved online, payment of the service are always made ONLY when the booking is confirmed, subjected to section 2. The storage duration is counted since appointed reservation time if the luggage is dropped after the appointed time. The storage duration is counted since when the luggage is dropped if the luggage is dropped before than the appointed time. If the luggage is retrieved before the appointed retrieval time, NO refund will be made. If the luggage is retrieved after the appointed retrieval time, additional service WILL BE applied based on the fee of the local branch, subjected to section 1 in price list and promotion charges. For walk-in orders, payment of the service are always made ONLY when the luggage is retrieved except the storage duration is longer than 30 days. The customer SHALL deposit 2,000 THB for each piece of luggage if the storage duration is longer than 30 days. The deposit 2,000 THB IS NOT refundable. The customer can ONLY STORE luggage or belongings DURING SERVICE HOURS according to the regulation of each AIRPORTELs branch. Luggage can be stored up to 6 months (180 days). To extend storage duration, please contact AIRPORTELs by [email protected] and get confirmation ONLY from AIRPORTELs e-mail, [email protected]. 1 month (30 days) after ETP (estimated time pick-up) and without the extension for storage duration, the luggage will be disposed of as the property of AIRPORTELs. The customer SHALL always get a retrieval slip after stores luggage at AIRPORTELs. If the customer wants to pick up any belongings from the luggage during storage, the customer SHALL retrieve all belongings AND close the order. AIRPORTELs WILL NOT open customer luggage or take any item from the luggage in any conditions or upon customer request EXCEPT in cooperation with official or governmental authority under lawful investigation. AIRPORTELs SHALL NOT be liable for any FRAGILE, PERISHABLE, or PROHIBITED item(s) or contents of your luggage stored in our storage. For storage at AIRPORTELs branches count one day as 24 hours since the customer store luggage at AIRPORTELs branch. An additional piece of luggage security tie, a yellow tie with AIRPORTELs logo and serial number, is 20 THB/Piece. The customer SHALL provide the valid references, including passport/Thai ID/Thai Driver license AND retrieval slip/e-mail to AIRPORTELs staff to verify the consignee identity at AIRPORTELs counter. If the customer doesn’t have valid or correct order reference, AIRPORTELs SHALL reserve the rights to deny retrieval request. If no request for delivery is placed, the customer can ONLY retrieve luggage or belongings at the same branch which the customer uses storage service. AIRPORTELs DO NOT accept any partial retrieval request during storage service. The customer can ONLY RETRIEVE luggage or belongings DURING SERVICE HOURS according to the regulation of each AIRPORTELs branch. The customer can ONLY RETRIEVE luggage or belongings at AIRPORTELs counter at each destination. In case that stored belongings will be retrieved by the other person or any other 3rd party, the valid Thai ID or passport information shall be provided by the customer who stores the luggage by e-mail. Valid Thai ID or passport will be requested when the consignee retrieve the belongings. Copy or photo of ID card or passport of the entity IS NOT accepted. Starting from the announced closing time of each branch of AIRPORTELs, 500 THB/30 mins will be charged if the customer wants to collect luggage after service hour at any of AIRPORTELs branches. If the excess time is less than 30 minutes, the charge WILL BE counted as 30 minutes. AIRPORTELs SHALL wait for customer ONLY up to 2 hours. AIRPORTELs SHALL wait for customer ONLY only upon customer’s request via e-mail. If customer request to retrieve luggage after service hours but doesn’t come, 500 THB/30 mins will be added to the order when check out. AIRPORTELs reserve the right to deny the request under any circumstance. Promotions that IS NOT listed in the following information is EXPIRED or DOES NOT exist. For storage at AIRPORTELs, one day is counted as 24 hours since the customer store luggage at AIRPORTELs branch. A fraction of one day (24 hrs) is considered as one day. DMK Don Mueang Airport: 75 THB/One piece of Luggage/24hr. Delivering luggage to and from airport, hotels and shopping malls in Bangkok. Price: 600 THB/One piece of luggage/Way in the same city. Conditions: Luggage can be delivered in 3 hours at the fastest in the same city. Delivering luggage to and from airport, hotels and shopping malls in Phuket. Conditions: Luggage can be delivered in 6 hours at the fastest in the same city. Delivering oversize luggage to and from airport, hotels and shopping malls in Bangkok: 800 THB/One piece of oversize luggage/Way. Delivering luggage from Bangkok to the other province in Thailand: 900 THB/One piece of regular luggage/Way. The booking SHALL be reserved at least 24 hours before using. The discount is only valid for online booking and CAN NOT be applied at AIRPORTELs counter without booking. The service IS NOT available for OVERSIZED luggage including but not limited to Sport equipment, Baby Carriage, and Music Instruments. DMK Don Mueang Airport: 69 THB/One piece of luggage/24hr. Long-term storage package at Don Mueang airport, Suvarnabhumi airport, Terminal 21 Shopping mall Asok, MBK Center, Central World, Terminal 21 Pattaya, Central Floresta Phuket, Central Patong Phuket. 7 days storage: 500 THB/One piece of Luggage. 30 days storage: 2,000 THB/One piece of Luggage. MBK Center: Free storage for 4 hours during 10:00 – 22:00 on the same day. Terminal 21 Shopping Mall Asok: Free storage for 3 hours during 10:00 – 22:00 on the same day. Central World: Free storage 2 hours during 10:00 – 22:00 on the same day. Terminal 21 Shopping Mall Pattaya: Free storage for 2 hours during 11:00 – 23:00 on the same day. Central Floresta Phuket: Free storage 2 hours during 10:30 – 22:00 on the same day. 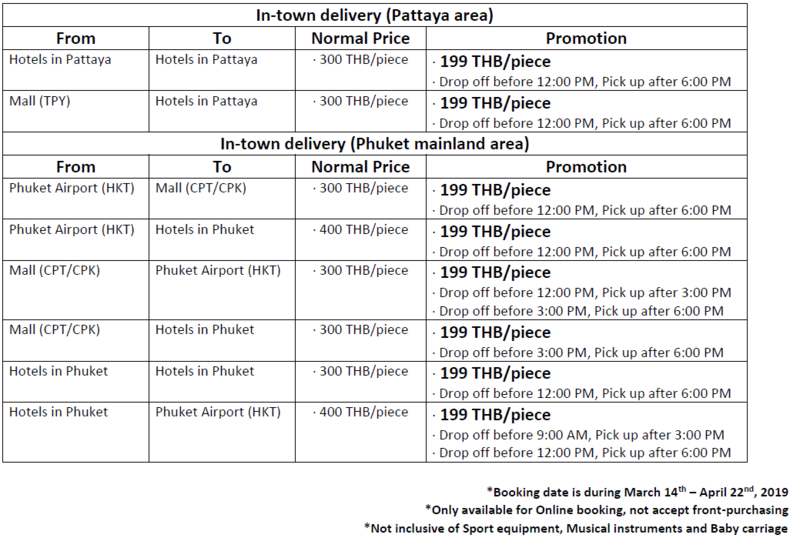 Central Patong Phuket: Free storage 2 hours during 10:30 – 22:30 on the same day. All shopping mall free storage service can only be used ONCE with the same luggage OR passport during service hour of the bran on the same day. Price: 400 THB/One piece of luggage/Way. Dropping luggage at hotel concierge BEFORE 9 am and receive luggage AFTER 3 pm at the airport on the same day. Dropping luggage at hotel concierge BEFORE 12 pm and receive luggage AFTER 6 pm at the airport on the same day. Price: 300 THB/One piece of luggage/Way. Dropping luggage at hotel concierge BEFORE 12 pm and receive luggage AFTER 3 pm at the airport on the same day. Dropping luggage at hotel concierge BEFORE 3 pm and receive luggage AFTER 6 pm at the airport on the same day. From AIRPORT to AIRPORT in Bangkok. From HOTEL to HOTEL in Bangkok. From AIRPORT to HOTEL in Bangkok. From HOTEL to HOTEL in Phuket. From HOTEL to HOTEL in Pattaya. Only available on business days: Monday – Friday. Luggage delivered on weekends or Thai public holidays will be delivered on the next business day. 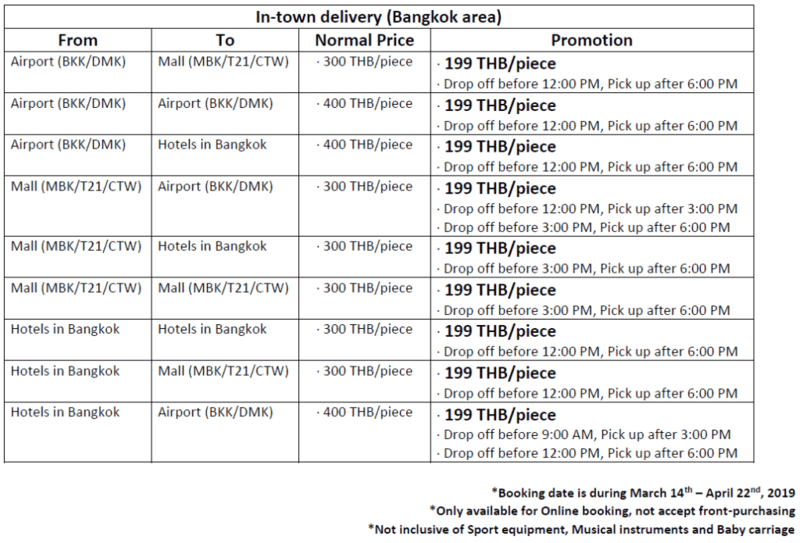 For nationwide delivery service in Thailand, AIRPORTELs DO NOT guarantee for on-time delivery at certain appointed time. Service area: Bangkok, Chiang Mai city downtown area, Phuket main island, and Pattaya city. The service is only available for regular traveling luggage. AIRPORTELs reserve the right to refuse delivering luggage if the belonging(s) is out of conditions. Dropping luggage at the origin BEFORE 12 pm and receive luggage AFTER 9 pm at the destination on the same day. Price: 199 THB/One piece of luggage/Way. Service location: Phuket International Airport HKT, Hotel, Central Floresta, Central Patong in Phuket. Delivering luggage from HOTEL to AIRPORT in Bangkok. Price: 400 THB/One piece of luggage/Way for the first piece of luggage and 199 THB/One piece of luggage for additional ones. Price: 300 THB/One piece of luggage/Way for the first piece of luggage and 199 THB/One piece of luggage for additional ones. Dropping luggage at the starting point BEFORE 12 pm and receive luggage AFTER 6 pm at the destination on the same day. Delivering luggage from Bangkok to the other province in Thailand: 700 THB/One piece of regular luggage/Way. Dropping luggage at the origin BEFORE 12 pm and receive luggage AFTER 12 pm at the destination on THE NEXT DAY. Same-day nationwide luggage delivery service: 1,000 THB/One piece of regular luggage/Way. MBK Center: Free storage for one day during 10:00 – 22:00 on the same day. Delivering luggage to and from airport, hotels and shopping malls in Bangkok: 600 THB/One piece of regular luggage/Way. Delivering luggage from Bangkok to the other province in Thailand: 850 THB/One piece of regular luggage/Way.